Today's Prompt: Start out by thinking of a health cliche that really bugs you. What are you tired of people asking you or saying to you again and again about your health or health condition? Write it down. Then, instead of critiquing it (as we often do) – today, reclaim it! 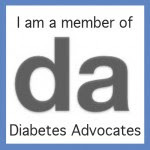 Cliche- Type 1 Diabetics cannot eat sugar. Do I eat this stuff all the time? No. But I can and do when I want to! I think that one is so widely disseminated. People are shocked when they see Joe eat *GASP* carbs. More shocking is when I am shoving Starbursts at him to treat lows. Great post AND I love your new design over here. I was worried for you when I read your FB status. Looks like you got it tweaked-up just fine Jess. What a great new blog design! Have a fun weekend and I hope you get to enjoy a carby treat.